It’s about 5:30 am right now and absolutely a beautiful day in Tel Aviv. The streets are quiet but we know it won’t stay that way soon. It is a blessing to be touring in the Land of Jesus. This is our first full day. We will drop off Takako in the Church and start our touring. We arrived safely in Tel Aviv after a 11 1/2 hour trip from Korea. Korean Airlines is awesome! All they did was fed us. We had our typical two meals but in between they gave us chips, drinks, pizza roll, onigiri (Korean style bugogi filled or Tuna Kimchi) Takako loved it. Those were just the main things, they always kept us happy. As you can see, we arrived in good spirits. We picked up our rent a car and we were ready to go! We are taking a straight shot across Asia flying right over China. We can see some snow still on the mountains. It is defintely a good flight. We don’t have private video screens but we are able to do a lot of fellowshipping. It still amazes me that we are able to stay in the air so long in these planes. God is so good! It was a bummer saying goodbye to Daniel and Jesse, but we know we will see these guys again. Please continue to pray for Jesse as he seeks the Lord’s will in his next step. He will be heading back to the States next week, to pray, seek God and find out what He would have him do next. We love you guys, God bless you! Rob is drinking Eder’s favorite; Banana Milk. When Eder is in Korea he cannot resist this stuff. Don’t worry bro, Rob will drink enough for both of you. We had some bugogi and Korean Style Pork, yummy! We got together for a Jesus style meal (sharing from the same plate). It was some excellent food. Takako is fitting in real good with the brothers, I bet she cannot believe that we eat so much! She only have one more day with us. We arrived in Korea and right when we came through immigration Daniel and Jesse were outside waiting for us, it was such a blessing. Vunder was excited to see the guys. They took a 3 hour bus all the way from Daejeon to spend some time with us. They are going to spend the night with us in the hotel tonight. The World Cup is a phenomenon that has gripped the world like never before. I remember being young and having no interest in the game. That was until I met my good friend Tino (Juventino) who was an incredible soccer player. We attended HIgh School together but did not really know each other. He showed me the value of the game when I used to think that is was just a bunch of guys kicking the ball with no plan at all, I as totally wrong. That year (1981) I wrestled and our team won League Champions, that same time our Soccer team also won. Because Wrestling was a bigger sport, we got a lot of fame but our Soccer team won with little fan fare. But things have now all changed. It is amazing to see the World glued to the TV set and see countries here in Asia routing for their team with blazing frenzy. But let us not forget as Christians when the real “World Cup” will happen. It is kind of scary but the Bible tells us that the Bowl Judgments will take place during the second half of the Tribulation. It is when the Lord will “pour out “ His wrath upon the unbelieving world. We are still living in a time of Grace, man can still be saved. But there will come a time when that time of grace will be gone and God will bring judgment on the earth. “Let us work while it is still day, the night is coming when no man will work”. Wherever Joe goes he shares the Gospel. It was great to back him up in prayer as he spent a good time in the flight witnessing to a group of mormon young gals. We look forward to what the Lord will do as we follow our brothers lead. Please pray for us, that we would use every opportunity to share the Love of Jesus Christ. I have flown a lot of different airlines, but I have never had the meal that I did on Korean Airlines. First of all the utensils were steel, and the plate ware was ceramic. Your choice was either Fish or Bimbim bop. Both were excellent, and after wards they gave us Hagen Daus ice cream. A real treat. The flight from Hong Kong to Korea is only 3 1/2 hours, but the flight attendants were constantly working bringing drinks and the such. A good experience. We made it through immigration and are awaiting our next flight to Korea. It is great when the airports have wifi, so you can check up with the rest of the world. Rob checks his baseball scores, and the rest of us either blog of facebook. It is good being rested up. The taxi ride from HK Airport to the hotel is supposed to take 50 minutes. The taxi driver took us through the mountain and we got there in 30 minutes. He saved us 20 minutes. But it was a fun, wild ride! Towards the end we were kind of getting queasy. On the way to the airport, it was a nicer drive, it was pouring rain, but the scenery was beautiful! You could see the beautiful islands and the ocean as we served through the mountain. Again, Joe got a little sick, but he was daijobu! This time the driver got us there in 25 minutes. These taxi drivers are awesome! Also, the cool thing is that we had 6 people total in the taxi, plus all our luggage! He just strapped it down and away we went! It is now time, off to Korea. We will fly into Incheon Airport and spend the night in Korea. Daniel is going to meet us at the airport, we will have dinner and hopefully he will spend the night with us. Daniel is really looking forward to seeing the Vunder, he has not seen him in a while. Early in the morning Chuck and Vunder went for a run on the beach and in the mountain. Pastor Tom tried out his new TRX training straps that we made, it was a good morning. We arrived late last night into Hong Kong Airport, and took a taxi to the hotel (a wild ride). We all had a great night sleep. The Silvermine Beach Hotel was real nice. The rooms were cozy and the breakfast was Awesome! So much fruit! We were really blessed. We are now in Taipei and Takako is online. She hooked into the free wifi in Taipei and she is facebooking. Getting caught up with her many fans. The rest of the boyz are out exploring. We have about an hour layover and we will start boarding for Hong Kong. Our first miracle of the trip began in Okinawa. Joe Tipton was issued a new passport, but he forgot to have his re-entry permit stamped in the new passport. They were not going to let him fly, but the Lord is awesome. The ticket office said that we would have to talk to the immigration officer, but when we went through immigration it was not a big deal. I think that it had to do with the Lord distracting him, but that is another story. We begin our flight starting from Okinawa with a final destination to Taipei. We will fly from Okinawa to Taipei, Taipei to Hong Kong (spend the night in Hong Kong), Hong Kong to Korea (spend the night there) and then Korea straight to Israel. We are looking forward to getting some Korean food in Seoul and hooking up with Daniel. Please pray for us, the adventure begins. When we came back from the States, Joanna made sure to bring back some yellow corn tortillas. Pastor Tom used to run his father’s Tortilla Factory back in the States so he knows the importance of “Yellow Corn”. Everyone loves Spam in Okinawa so instead of beef in the middle be put the good stuff. We fried them up and whalla! Spam Taquito’s, you just cannot get enough. Chaplain Keith put on a good BBQ for the interns. We hope you like the pictures, everyone got into the act, even Asa. We were afraid that he ate too much and was about to “lose his lunch”, but he was ok. Too many hotdogs and hamburgers, but it was good! The Neely family looks great! Yoshi (Kayo’s brother) drove down with his girlfriend to attend Kayo and Andrew’s reception. It looks like they all had a great time, I wish we could have been there. In the top picture we see Kayo sampling a pretzel at the Pretzel Factory, Andrew said that she loved it! Have a great time Neely’s we miss you so much. Chaplain Keith from Kinser Chapel invited all the Ginowan students and interns for a special BBQ. The Keith’s will be leaving Okinawa next month and wanted to do something special for the students that are here for the summer. At the same time we celebrated Pastor Tom’s Birthday, he is 46 years old. Thank you Chaplain Keith, it was a great time! Our flight from Taipei to Okinawa does not leave until the morning, so we are staying at the Novotel Hotel right next to the airport. This is the first time that the kids have ever left Taipei Airport, this is exciting for them because their Grandma Yumiko was born in Taiwan, back then it was called Formosa. Their Grandma was born in Formosa (Taiwan) but raised in Tokyo. We leave for Okinawa tomorrow at 8:15am. This is the first day flight back to Okinawa on China Airlines that we have ever flown back in daylight. Usually we leave at 1am, but this flight left at 3pm. I like day flights, you are not as tired, but we will see, flying high in the sky chasing the sun. 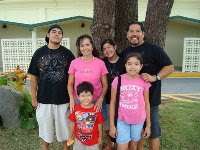 The Ruiz family is flying back to Okinawa but Zach will be staying back for another 10 days. On June 28th a group from Okinawa and a few from California will be meeting in Israel. The “Heman Israel Trip” is gearing up, but first is first, let’s get back to Okinawa. The crew came over last night, as we prepare to head back to Okinawa on Wednesday afternoon. It was a blessing to have some cake and ice cream and just hang out (also celebrating the Lakers game 6 win). We all had a blast! When I was young (little boy) my mom used to make use homemade tortillas. Well for some reason she started making them again, she said that she has not make them in about 30 years. What made her start cooking them again? She said that she found her old rolling pin, my dad used to work at Kaiser steel and he had his friend cut this stainless steel pipe and sand it down making it into a rolling pin for my mom. When my mom brought out the rolling pin it brought back all kinds of memories for me. I remember using that pin for a hammer when I was working on something, it was like “go get the rolling pin I need to hammer something”. My mom said that it all came back to her. Now making flour tortilla’s is not easy, but there she was making the dough, rolling them out, heating them up, she make 3 dozen, from start to finish 45 minutes, I was amazed, and my stomach was happy! We had a great time in Bishop. It was 5:45am and it began to snow. It was not that cold but then the cold front began to come in. We were catching fish, but as soon as the snow fell, the bite was off. It was a good experience something that would NEVER happen in Okinawa! We were up at 5 o’clock and on the lake by 5:30am. Good thing it was only located right down the street. As the sun came up over the mountain it was breathtaking. Talk about being close to God in the still of the morning. It was a blessing to get into the Word at night and allow for some sweet ministry times. The guys were all blessed; fishing in the day and in the Word at night, a great combination! It was so cold up at South Lake. The lake was not frozen but parts of the walk was filled with snow. It made the fishing a little slower, but that did not slow us down, we were in the hunt for dinner.